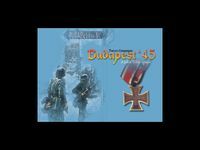 Budapest '45 covers this campaign in 31 scenarios, including the Soviet prelude to the encirclement launched on 29 October. The main campaign focus, however, is Operation Konrad itself. The operation was divided into three phases and each phase is covered as a separate scenario. There is also a month long master campaign scenario, as well as the usual array of smaller battles which took place during this operation. We have also included a historically plausible situation to explore what might have happened had the Germans diverted just one panzer korps from the Battle of the Bulge in the west and instead sent to Hungary. What impact would it have had?